It’s your turn to be a Chef and experience the richness of Maldivian cuisine. 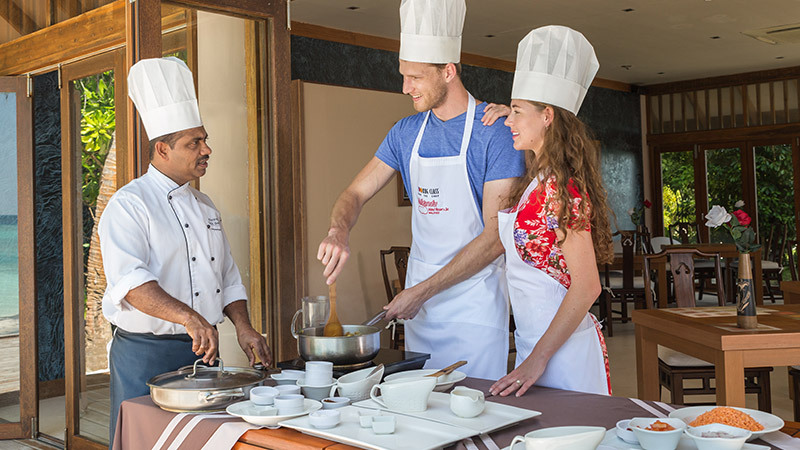 Our culinary team will teach you all techniques and give you advise to make mouth-watering dishes to impress your family and friends back home. Our bar team is delighted to demonstrate how to mix, blend and shake cocktails professionally. This great experience will give you knowledge to create two cocktails, blending fun and excitement. At the end of the class, you will enjoy your creations in a private setup at the sand bank whilst watching the sunset. For more information or to order your meal, please contact our Food & Beverage Team or Guest Services directly.